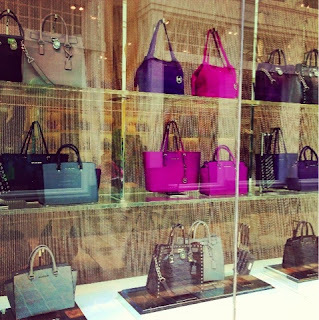 One of my favorite pastimes is window shopping, especially at Michael Kors. I hate to say it, but if you're in the market for a great bag this season, you might want to skip MK. Except for the Jet Set Tote, it's pretty blah. I've previously posted a review of the Jet Set Saffiano Travel Tote, which is shown here in pomegranate (center), purple (right center just behind the clutch) and black (left center). This is a fantastic bag, especially at the $188 sale price. On the left center panel just in front of the Jet Set is the Large Selma Two-Tone Satchel in black/dark slate (magenta and purple versions are on the same row). I don't love this. Because of the way this bag is designed, the side panels flair out when the top is closed. This looks like wings, and not in the beautiful Marc by Marc Jacobs way. The zip closure and five inner pockets are minor good points, but not enough to make me cough up the $358 asking price. On the top left is the Large Hamilton Saffiano Tote in pearl gray. You can see a smaller version on the top right in purple and black, and the crocodile-embossed at bottom center. This bag doesn't wow me either. The best part of this bag is the beautiful Saffiano leather. I like the dedicated inner cell pocket, and the feet on the bottom give some added protection. But really, I'm pointing to inner pockets as selling points? That should be a given. Also, the 3 3/4" handles are too short for the 13" height, and the longer strap incorporates a chain that I just can't get past.. At $358, this is not as good as Michael Kors can be. Final score: although the Jet Set Saffiano Travel Tote has become a work staple for me, I don't love the rest of the current Michael Kors collection. I'm looking forward to the change in seasons for better choices. Bonus: I didn't see this in the store, but shopping around online I've found one I love. Have you seen the Skorplos Grained Shoulder Bag? At $895 this is definitely out of my price range, but I had to let you know it was there. P.S. the details for the Liebster award are now up on my blog so stop by and check them out so you can officially be entered!